We Grow You Mow was designed to give the mowing home owner or landscaper the lawn they’ve always wanted. Our standard 7 step program includes all the nutrients and broad leaf weed control your lawn requires. We take a probiotic approach to the health of your turf. All of our ingredients that we custom mix at our facility are top quality. 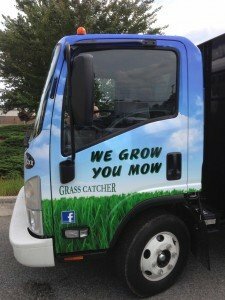 Our nitrogen rates are very accurate, we will not under or over fertilize your lawn. We offer 4 packages with a convenient 12 month pay plan. ROUND 1 - Weed control and crabgrass preventative are applied to minimize unsightly lawn weeds. At the same time a balanced, slow-release fertilizer containing a custom blend of nitrogen, potassium, sulfur, and magnesium are applied plus a natural based blend of bio-stimulants from natural sources to condition the soil. ROUND 2 - A balanced, slow-release fertilizer containing a custom blend of nitrogen and calcium plus a natural based blend of bio-stimulants from natural sources to condition the soil. A second weed control and crabgrass preventative are also applied at the same time. ROUND 3 - A slow-release fertilizer containing a blend of nitrogen, calcium, and iron plus a natural based blend of bio-stimulants from natural sources to condition the soil. Existing weeds are spot treated with a post-herbicide. ROUND 4 - A biologically enhanced slow release nitrogen along with a heavy dose of phosphorus and potassium are applied to your turf grass. This application aids in the upcoming seed development the following month. Weeds are spot sprayed as needed. ROUND 5 - A high-analysis, slow-release nitrogen fertilizer is applied to promote healthy grass and root growth. This is a safe, slow-release fertilizer that is designed to not burn a lawn. This application is designed to help keep your lawn fresh and green through the fall. ROUND 6 - A balanced, slow-release fertilizer with nitrogen, phosphorus, potassium, and iron. We also apply our biologically based micronutrient blend for soil energy and conditioning. The blend has been specially formulated to promote healthy grass by stimulating root growth through the winter, as well as enhancing winter hardiness. Where needed, a herbicide is applied to control broadleaf weeds. ROUND 7 - Winterizer - The cold weather months are the time of the year when energy is stored in the root system of your grass in preparation for spring's renewed growth. A heavy application of a sulfur coated nitrogen fertilizer is applied to the lawn to help with spring green-up and promotes root development. Where needed, a herbicide is applied to control broadleaf weeds. Fungicide application: fungicides can be applied to combat rhizoctonia brown patch (by request with recommendation) at the same cost as your standard application rate. We will let you know if fungus is present in your turf and will advise you. Organic base soil amendment is include in this application. This can be applied at a preventative rate once a month for 5 months during the summer. Compost topdressing: we are able to spread a light or heavy layer of organic compost over top of your grass seed. By doing this, you increase seed germination drastically. compost will keep the seed warm, retain moisture, and give you the seed to soil contact that is needed. Nitrogen : nutrient required by most turf species to grow and maintain color. Rates vary depending on the time of year. Excessive nitrogen is not applied for turf health reasons. Pre-emergent weed control : creates a barrier on the soil surface to prohibit weed seed germination. Abnormal amounts of rain or irrigation will break down pre-emergents early and may allow some weed breakthrough. Application timing is so that no pre-emergent is present at aeration and seeding so that it will not effect grass seed germination. Post-emergent weed control : targeted to kill visible broad leaf weeds in turf. This does not kill grassy type weeds. (Bermuda, Dallas grass, Johnson grass, goose grass, ect. ) eradication of grassy weeds can be done by request at an additional cost after it's been discussed. Fungicide : used to combat rhizoctonia brown patch. Brown patch is a weather-related issue. Lots of rain combined with high humidity will allow the unsightly symptoms of brown patch to appear. Fungicides can be applied at a preventative or curative rate. We offer a summertime 5 step application schedule to you to ensure that brown patch is not present. This is an additional cost. Blanket application : done with a hand held spray gun controlled by a technician. Entire yard is walked to ensure thorough coverage. Liquid product stimulates the stomata on each plant to encourage uptake of nutrients and weed controls. Can also be done with a motorized boom sprayer on large properties. We recommend you allow your turf to completely dry before you walk on it. Our recommendation is that you may cut your grass 24 hours after application and that you NOT bag your grass. By discharging or mulching your clippings, you add free nutrients to your soil. When you bag your grass you are taking away from the soil what we apply.